What do I want to make in Project Spectrum hues? Socks, of course! This is the beginning of the pair I started last night. I like ’em! I tried a lacy pattern with YO’s and stuff, but it was too fussy. This is perfect for the stripey yarn. 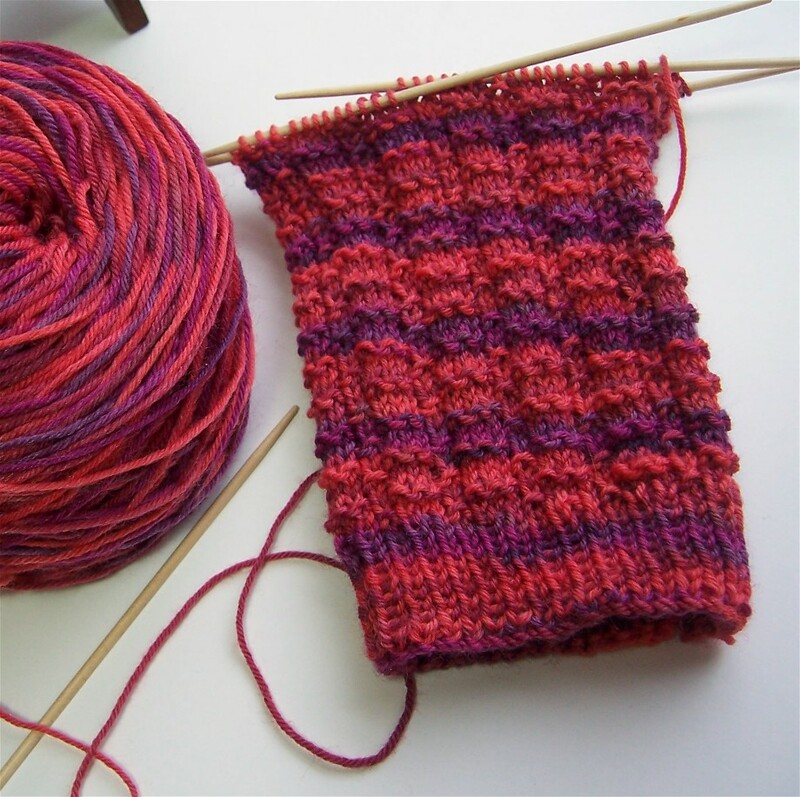 Pattern: Just your basic Ann Budd Sock Formula. K1P1 ribbing. Stitch pattern is “Stansfield #10” from Sensational Knitted Socks. The lace scarf is still sitting in the basket, but not because it’s not going well. I’ve been too tired at night to do any knitting that requires concentration or sharp eyesight. There must be more knitting somewhere. Oh, right…there’s a Dulaan scarf, whose picture just doesn’t seem to want to appear despite several tries. Curses on Blogger! I just had to have a ball of frou-frou yarn (Patons Cha Cha, half off at Michael’s! ), and I just had to knit it up right away. I combined it with some leftover red Dale Sisik, so it’s thick and warm. It’s all pink and red and purple, sort of like the socks. I guess I have to ask you to use your imagination. You’ll also have to imagine the colorful photos I tried to post for Margene’s Project Spectrum meme. Blogger ate them, too, when I tried to edit just now. I’m trying not to be cranky. I seem to be having one of those weeks. Where did the time go? I think work is beginning that slow acceleration as summer draws near; more books are arriving every week, there’s more activity in the village, and I feel busy again after a few weeks of quiet. I enjoyed my visits to all the back yards, and I’m flattered by all the nice comments on my snowy photograph. I think I’ll print one up and give it to the S’s (my landlords). They’re some of the best folks around, and they take care of Herself when I’m out of town, to boot. I’m beginning the mental preparation for a trip to visit my mother on the 19th; the physical prepararion (the laundry and cleaning) will commence soon. She’s been having a difficult time, and I miss her. I’ll be meeting up with my niece R, who will be on spring break and is flying in from Chicago. I haven’t seen her since last summer, and I can’t wait to spend a few days catching up. She’s the least gabby of my two Chicago nieces, but we’ll end up hoarse anyway! I’m blessed to have two sets of R’s in my life — they have exactly the same names. The Big R’s are in Chicago, and the Little R’s are right here. Knitting circle this afternoon — must remember to take my Olympic sweater to show it off! It’s probably too warm to wear it, though. That thing weighs a ton. Love the color of your PS sock. I’m going to look up the pattern, too as it really shows off the colors well. Sorry we don’t get to see your photos. Check out the Lady Eleanor stole I made out of the same colorway! It’s on my blog ellieknitz.blogspot.com.